An ordinary oven cooks by enveloping food in hot, dry air. This hot air heats the outside of the food, and then this heat is conducted from the outside of the food toward the inside of the food, until it's cooked all the way. To put it another way, the outer parts of the food are heated by the oven, and the inner parts are heated by the already-heated outer regions that are adjacent to it. In a sense, the food cooks itself. But the outer parts are exposed to higher temperatures. That's why a roast can be brown and crusted on the outside but still medium rare in the center. The air in the oven might be 400 F, but the center of the roast is 135 F.
Now, in a convection oven, the fan produces extra energy. It takes the hot air and blows it around, literally increasing the force with which the hot air meets the surface of the roast. If you've ever sat in a hot bath and swirled the water around, the water feels hotter as it flows against your legs. But when you stop swirling it, the sensation of extra heat goes away. This is the convection effect, and it's precisely the same effect a convection oven produces with the fan. How much extra energy? 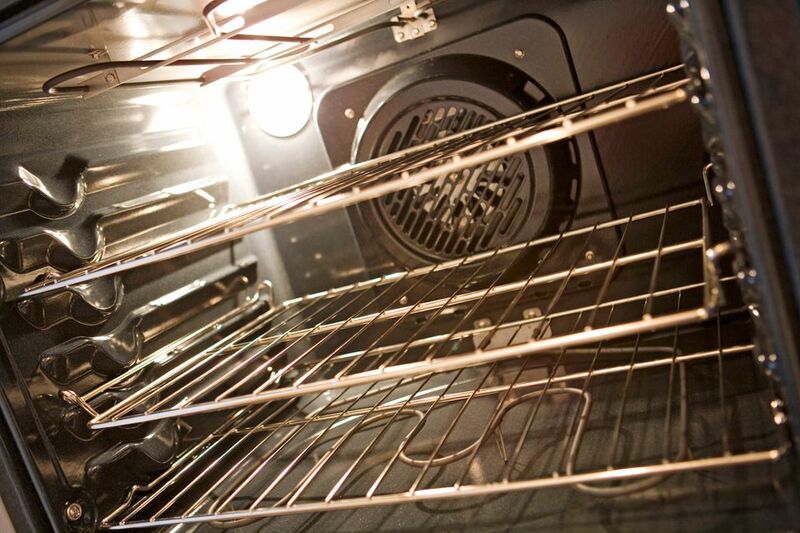 Convection ovens produce around 25 to 30 percent more energy, depending on the fan's power. This extra energy can be reckoned either in terms of temperature or cooking time. In other words, does a convection oven cook hotter than a conventional oven? Or does it cook faster? The answer is, both. Now, nearly every recipe in the world (other than ones in the booklet that comes with a convection oven) will specify temperatures and cooking times for conventional ovens. So cooking in a convection oven means you'll have to convert. This is a fairly simple matter of either lowering the temperature or shortening the cooking time (or a bit of both). The simplest method is to set the oven 25 to 50 degrees lower than the recipe says. So if it says 400 F, you go with 375 or 350 F.
But watch out! Some convection ovens actually make a heat adjustment for you. That is, if you set a convection oven for 350, it might actually set itself to 325 to compensate. You need to read your manual to understand how your particular model works and the suggested adjustments to make. You can also (assuming your oven does not self-correct), leave the temperature the same and instead shorten the cooking time by 25 percent. Moreover, you might want to lower the temperature by 25 degrees when baking cookies and pies, but 50 degrees when roasting meats. Indeed, some convection ovens offer separate settings for baking and for roasting. Because it is the surface of your food that this whooshing air is going to come in contact with, it is the surface of your food that is going to cook faster in a convection oven. The interior of the food will not feel this wind, although the radiant heat of the oven will simultaneously be cooking the food in the usual way (i.e. from the outside in). What does this mean? In short, convection ovens are wonderful for roasting large cuts of meat where you want them to be nicely browned on the inside but medium rare on the inside. That means beef roasts in general, especially prime rib, as well as leg of lamb, and to a lesser extent pork (which should be cooked medium rather than medium rare). It's important to make some sort of adjustment when roasting meats, however. The convection effect can dry out the surface of meats, and the higher overall temperature can cause roasts to shrink more than in ordinary ovens, as the additional heat squeezes the protein fibers. Turkey and chicken, on the other hand, need to be cooked all the way, which means well-done. But with a convection oven, you have a choice between lowering the temperature or shortening the cooking time. And in general, it's six of one, half a dozen of the other. But with poultry, you want to make sure the deepest part of the thigh is fully cooked, and the fan is not blowing there. In this situation, you're better off lowering the temperature and leaving the cooking time the same. Most convection ovens will have the fan mounted at the back, so the air blows forward. But in practice, the air just swirls around and around in all directions. Use pans with low sides to maximize the effect, and avoid covering your food (depending on the recipe, of course). Your manual will offer guidelines with respect to positioning the shelves for optimal airflow. Foods that don't fare quite so well in convection ovens are cakes, quickbreads and other items that start off as liquid batter. The forced air from a convection oven can actually produce ripples in the tops of these batters which then remain in the finished product. Because they produce very even heat, convection ovens eliminate "hot spots" in ovens, which means, for instance, that you do not need to rotate pans when baking cookies (although it's questionable whether this is a good idea even in a normal oven).